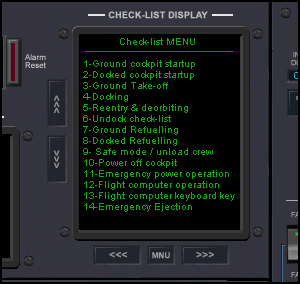 On the bottom panel (CLT+Down arrow) you'll find the Check-list MFD with check-list available for each stage of flight. be sure to read them before any stage, they will help you to configure the DGIV systems. Once a check-list completed and your vessel set for a stage you can ask the computer if the vessel is in the right configuration. You can find this feature on the computer display, choose option 6 in menu then select the stage you want, the computer will tell you if something is missing or if the configuration is set correctly.